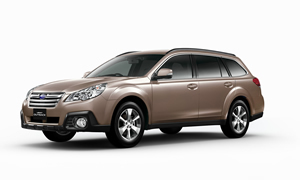 Tokyo, May 8, 2012 – Fuji Heavy Industries Ltd. (FHI), the manufacturer of Subaru automobiles, today announced the launch of Subaru Legacy and Outback with minor facelift. In the Legacy touring wagon and sedan model line up, a new performance model known as "2.0GT DIT*1" comes with the all-new 2.0 liter Horizontally-Opposed four-cylinder DOHC direct injection turbo engine. The models will go on sale from May 8 through Subaru dealerships in Japan. The product concept is "All Performance Enhancement" that covers designs, fuel efficiency, driveability and safety. In pursuit of further evolution to greatly exceed customers’ expectations, FHI has developed the Legacy and Outback with more extensive modifications than a typical yearly model change. Improvements include: a new Subaru design motif; improved fuel economy due to the new generation Boxer engine combined with the new Lineartronic (CVT); refined "Subaru Dynamic Chassis Control Concept" (Subaru DC3) to deliver enhanced driving pleasure with peace of mind; and Subaru’s renowned advanced driving assist system "EyeSight (version 2)". The new "2.0GT DIT" employs a new power unit: the 2.0 liter Horizontally-Opposed direct injection turbo engine and a Lineartronic (CVT) designed to meet the higher torque of the new engine. The 2.0GT DIT balances driving performance and environmental friendliness. In addition, by featuring a new suspension and exclusive interior and exterior designs with blue accents, the 2.0 GT DIT creates a sporty character with a high quality feel. Subaru’s brand statement "Confidence in Motion" is the foundation of its automobile development. Subaru is committed to engineering excellence and the creation of products in harmony with customer lifestyles and values. Its quest for "Enjoyment and Peace of Mind" through the Subaru experience hopes to achieve more Subaru fans. Subaru Legacy touring wagon "2.0GT DIT"
Subaru Legacy B4 "2.5i EyeSight S Package"
● Front face is re-styled, by adopting the headlamps and the hexagon grille which are design language common with other Subaru vehicles. The redesigned front bumper conveys wideness in the front face. These new design elements provide a shaper look for the Legacy. ● For the Outback, the original grille, bumper and large fog lamps emphasize not only a strong Subaru identity but also provide a more powerful look for the model. They also express the uniqueness of the Outback and the strong presence as the flagship of Subaru SUVs. ● By changing the color of the instrument panel to black-metal-like color, the whole interior design was made sporty. High-quality materials have been used for the seat surfaces of all grades. ● Electronic parking brake and "SI-DRIVE" switches were relocated for better usability. ● An electro-luminescent meter with multi information display features on the new models*2. A 3.5-inch color LCD was adopted in the center of the speedometer. In the display, information on fuel consumption and operational situation of the "EyeSight" is indicated to support eco-friendly and safe driving. ● The 2.5 liter new generation Horizontally-Opposed Boxer engine was newly adopted in the Legacy and Outback. Low to mid speed torque is improved, centered on manageability in practical use. The engine provides well balanced and exhilarating driving performance with responsive acceleration and fuel efficiency. ● The smooth acceleration, which is characteristic of CVT, was further improved due to better transmission response. The new Lineartronic (CVT) delivers linear and smooth acceleration responding to the driver’s intention. 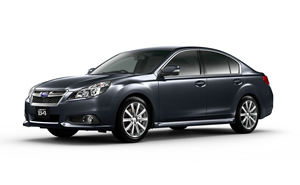 ● The new Impreza’s auto start stop system was also employed for the Legacy and Outback. It prioritizes the driver’s intentions so that the pleasant and secure feel of driving is not interrupted while it improves fuel efficiency. ● In order to restart the engine rapidly after being automatically turned off, and to facilitate driving in congested situations, the Lineartronic (CVT) models have adopted a starter that can restart even when the engine has not completely shut off. ● In pursuit of the ideal suspension setting that reacts to any road surface linearly, the rigidity of the chassis and body was further enhanced. This achieved Legacy’s sporty yet secure handling performance as well as riding comfort. ● The damping rate and spring settings in both the front and the rear were modified. In addition, suspension and body rigidity were upgraded with the addition of support sub frame in the rear that provides excellent stability. ● The specifications of dampers and bush parts were optimized. With reinforced suspension mountings, more responsive handling was realized. As a result, the Legacy-like fun to drive and a secure driving feel was heightened. ● Each function has been upgraded to increase user friendliness and create a more secure driving experience. ● By modifying the camera image recognition process, collision avoidance performance has been improved at low speed as well as when driving on curvy roads. ● When the vehicle is operating under "All-speed range adaptive cruise control" function, "Auto start stop system" can be operated without braking following the stop of the vehicle in front. When the vehicle in front restarts the system works with EyeSight to resume the adaptive cruise control function after the engine ignition. This advanced function improved both fuel efficiency and user-friendliness. ● By linking the system to the multi information display, the driver can easily recognize warnings and EyeSight operating conditions such as All-speed range adaptive cruise control system. ● When acceleration and brake pedals are applied simultaneously, the engine output is reduced while braking is preceded for better safety. The Legacy received "JNCAP FIVE STAR AWARD" in New Japan New Car Assessment Program (JNCAP*3) 2011. Conducted by the Ministry of Land, Infrastructure, Transport and Tourism and NASVA*4, JNCAP assesses and compares the safety performance of commercially available vehicles in Japan. This "JNCAP FIVE STAR AWARD" that Subaru won this time is the prize which is given in the finest 5-star rating car for the new overall safety performance rating. Renewal of power units, the new generation Boxer engine and the new Lineartronic (CVT), and addition of fuel saving devices such as the Auto Start Stop system contribute to the upgraded eco-friendly performance. Moreover, the multi information display monitor shows the state of fuel consumption to support further fuel-efficient driving. The Legacy Touring wagon, the B4 (sedan) and the Outback (2.5i L Package / 2.5i EyeSight) achieve the 2015 Japanese fuel standards*5. These models qualify for the new eco-car tax reduction and the eco-car subsidy. By combining the 2.0 liter Horizontally-Opposed Direct Injection Turbo engine with the Lineartronic (CVT) for high torque, the "2.0GT DIT" offers both driving performance with powerful acceleration and environmental friendliness. Blue accents are used on some parts on the exterior and interior of the car. The new suspension demonstrates sporty drive. The model was developed to deliver high-quality driving pleasure. ● Subaru’s own direct injection technology was adopted for the new generation Boxer engine. By injecting fuel directly into cylinders, combustion efficiency was heightened, resulting in both high engine output and fuel efficiency. ● To maximize the effect of the direct injection turbo, the engine bore/stroke was made square (86mm x 86mm). ● By employing the newly developed twin scroll type turbo charger with superior response at low engine speed, high performance with high engine output*6 and torque*7 was achieved. This twin scroll turbo charger was specially developed to meet the downsized engine capacity. ● Fuel efficiency was improved by 20% compared to the current 2.5 liter turbo engine. Exhaust emission performance was also improved. ● The new Lineartronic (CVT) was applied for higher torque of the newly developed 2.0 liter Horizontally- Opposed direct injection turbo engine. Some parts such as the torque converter and chains were modified to endure the high performance of the direct injection turbo engine. ● The torque distribution is controlled appropriately for sporty driving due to the VTD-AWD system*8 which was combined for the first time with the Lineartronic (CVT). As a result, both excellent traction performance and vehicle stability were achieved. ● The "SI-DRIVE" was finely tuned for the 2.0GT DIT. In case of Sport# (S#) mode, the driver can shift between 8 steps. In addition to the smooth shift change of the CVT, the driver can enjoy sportier driving by selecting the mode with direct feeling like AT or MT vehicles. The chassis was tuned exclusively for the high performance grade 2.0GT DIT. Suspension rigidity was reinforced for better stability during high speed driving. Vehicle sway was minimized due to damper tuning and enlarged stabilizer diameter, the 2.0GT DIT offers superior stability when changing lanes and cornering. The 2.0GT DIT has new design features for both the exterior and interior. The color blue is used as a design theme, expressing sportiness and high quality. ● The original gun-metallic 18-inch aluminum wheels are standard. High-intensity processing and cutting give the wheels a sharper look. ● A "DIT" rear emblem is employed, which expresses piston’s shape and direct injection ecological engine. ● A new engine cover was designed with a blue accent. ● The seats sides, door trim and center arm rest feature blue stitches. ● Polished large muffler cutters demonstrate a high-quality feel. Fuel efficiency was greatly improved while the high engine output and high torque were also achieved. Efficiency was improved by 20% compared to the current 2.5 liter turbo engine model. Driving performance and environmental friendliness were both achieved at a high level. The Legacy Touring wagon and the B4 (sedan) 2.0GT DIT achieve the 2010 Japanese fuel standards + 25%*9. These models qualify for the eco-car subsidy.